No, No kid it isn’t. Our future, and her future is going to be so affected by the outcome tomorrow, . This was a conversation I had with Athena yesterday afternoon, walking her home from preschool on her fourth birthday. I’ve never been political really until the last few years, until I became a parent really. I had a very vague idea of politics when I was smaller, and although I have always voted since I have been old enough to it’s only in the last few years I have started paying attention to politics properly, outside of all the campaigning surrounding a big vote. I believe that 16 year old’s should get a vote, but only if politics is taught in an unbiased way from key stage 3 upwards. Although I really want to tell everyone who to vote for I won’t. I shouldn’t. Voting is a huge privilege and not one to be taken lightly. Research, investigation and determination all need to play a part in who you vote for. But whoever you vote for please actually go and vote. The Brexit decision could have been different if all the people who chose not to vote had voted. 13 million people in fact. We could be in a very different situation right now if they had. 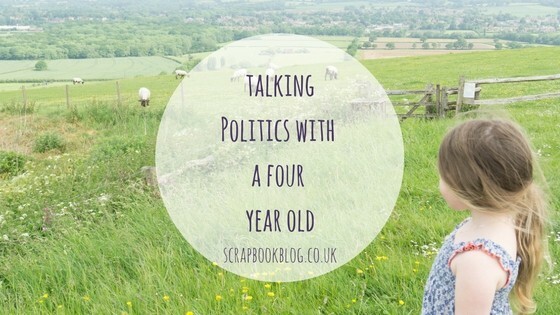 If you have kids, or might one day have them even if they’re not on the cards now then get interested in politics. Find out what the different parties represent. Work out what is important to you, for your future and for future generations. My advice would be to steer clear of social media slander and mud slinging, go direct to the source; look at the parties websites, attend an event with your local MPs, ask them the questions face to face. If you’re really not sure where to start then Vote for Policies is a good website to start with, you mark how strongly you agree with statements relating to various issues and it will give you a breakdown of which parties principals you align with via a percentage.